Having your text in the portable Document Format has become the most popular form as far as usage is concerned. This is not only because it has been recognised as the legal official way of presenting information but also it enables users to share images and texts. Comparing to Microsoft Word, it is hard to edit the files not unless you have the appropriate editing software. There comes a point where the need of converting PDF files to other formats. In the website is full of converting programmes but not all have easy to use interfaces with the required editing tools. Weighing the advantages and disadvantages of the converting tools iSkysoft PDF Editor 6 has been the greatest PDF to excel converting tool that I have ever come across. Apart from having the ability to send your documents directly via cloud storage platforms such as Drop Box and send email, user can perform a wide range of activities using this top notch converting tool such as adding mark ups and annotations. Features the stamping option that allows the user to add a personal signature on a PDF file for security purposes. Comprise of a very advanced Optical Character Recognition feature in technology that allows user to work on scanned on documents making the converting process and other activities such as editing even much easier. Comes with a batching feature that allows user to convert multiple PDF files at a go to the desired format. iSkysoft PDF Editor 6 supports the converting of files to a wide range of file formats into Word, Excel, PowerPoint and HTML. Has a very easy interface that works almost similar to that of Microsoft Word that has nine tabs that have a very rich backlog designed to make the converting and editing processes easier. Such tabs include the view tab which allows users to zoom in or out or choose the number of pages to read and the commenting tab as well that allows the choosing of marks to mark-up your PDF file. With this kind of programme running on your device, the user is guaranteed of file protection as they can take advantage of the password protection feature that allows them to protect files with encrypted passwords and digital signatures thus maintaining that good business reputation. User does not have to worry on having to remember on the notes and alterations that he had to place on the PDF file as the mark ups and hand drawing automatically helps you in such areas. iSkysoft PDF renders professional services that means the quality of output should not be anything to worry about thanks to the smart and easy to navigate user interface. It minimises the process of printing documents so as to have them signed by sending them to colleagues this is because this can be done electrically especially for confidentiality purposes. 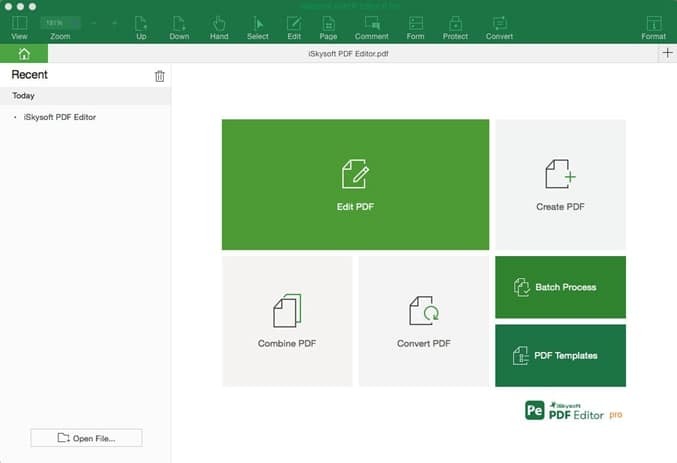 Looking at the batching feature it is clear with this ability in a PDF converter such as this it will be saving on time especially for the always busy users. Once the software has been downloaded in your device as that is the only way to have it running in your device. User should ensure that it is compatible with the devices operating system and user should always look to have the version with the most advanced feature and later installing it. A double click on the program after putting it on the Application folder will launch the iSkysoft PDF Editor 6. At the welcome page several features are included which are “Create PDF”, “Edit PDF”, “Convert PDF” and “Combine PDF” and an access to the Top Menu. The second step is importing your PDF file to that program. This process is anticipated to take only a few seconds this is because the process of adding the user has to hit the “Open File” button located at the bottom left side of your software. On clicking the button, there will be an option to select the desired PDF file from your folder storage to add it on the program. A quite easy procedure to add your file for conversion to the program. If you trace back to the first step you it had indicated that at the welcome page, there was the “Convert PDF” option. Once you click on that option, the program will ask the format that you wish your PDF converted to. The final stage of your converting process is by hitting the “Convert” button that is always located on the right side of your page. Once the conversion process is completed, you can view it from your program by clicking on “Open”. Apart from converting your Excel spreadsheets, iSkysoft PDF Editor 6 allows the user to allows the pasting of PDF files to Excel directly. From the above information about this magical PDF Converter it is indeed evident that the iSkysoft PDF puts performance in priority rather than the pricing. 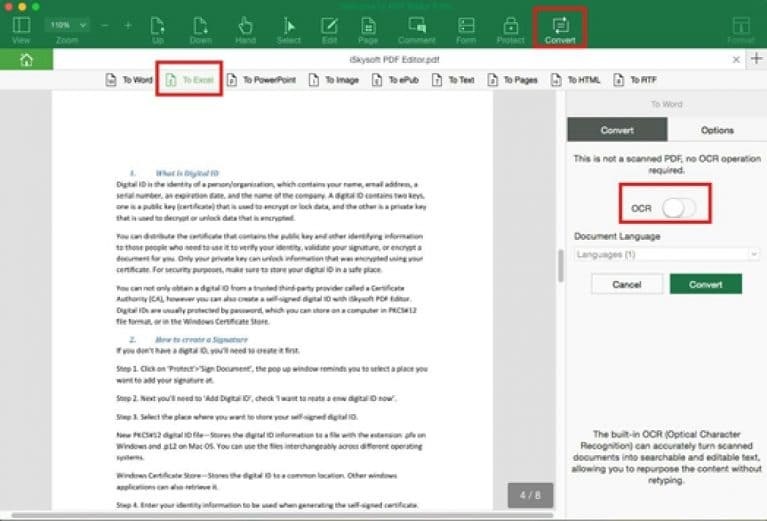 No PDF Converter that allows the user to perform a wide range of actions without switching from one PDF Converter to another. 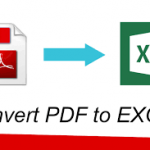 This one of a kind converter deserves being awarded the best PDF Converting app. Comparing it to other software, the iSkysoft PDF Editor 6 helps its users to discover much that they can do with their PDF Converter. Those who have tried can testify to this. Since trying is believing, a giving a try will mean no harm.